Tourists on Mykonos' famed waterfront. 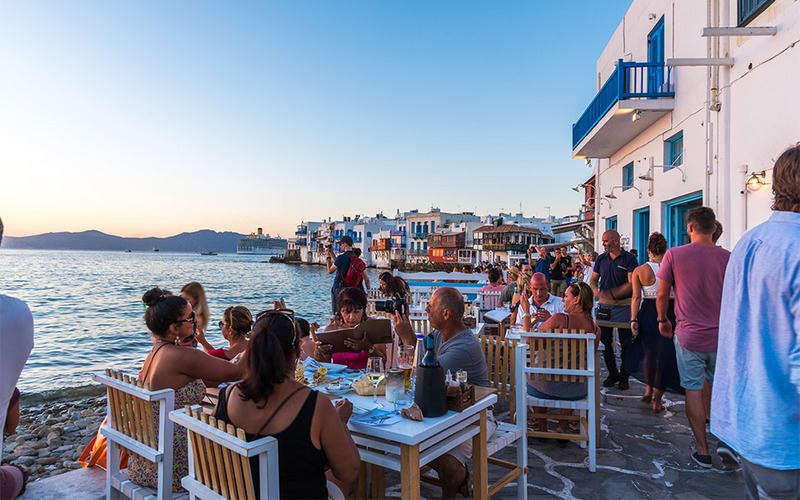 Tourism continues to lead efforts to revive the Greek economy, but experts warn that high taxation renders Greece vulnerable to competition. Despite the excessive taxation, tourism last year directly accounted for the creation of 10.3 percent of the country’s gross domestic product, while the sum of its direct and indirect contribution is estimated at between 22.6 and 27.3 percent of GDP, according to the head of the Greek Tourism Confederation (SETE), Yiannis Retsos. In the context of SETE’s 26th general meeting, Retsos said on Thursday that tourism has managed to retain its role as the protagonist in the effort to get the Greek economy back on track for yet another year, even though Greece as a destination is facing increased competition and the local tourism product is overtaxed. He went on to cite the necessary conditions for tourism to keep growing: They are summarized in the maintenance of political and economic stability, the creation of a realistic and stable tax framework, the operation of a flexible credit system, the development of a national zoning framework, and the enforcement of the rule of law. At the same event, Aegean Airlines chairman Eftichios Vassilakis tabled a proposal for taxation incentives with the aim of reducing the seasonal character of tourism, and stressed the need to reduce the tax and social security burden on employees in the sector.